Free crochet eBooks are a great resource for free crochet afghan patterns. You can find the greatest collection of afghan patterns within these books. You can find amazing afghan patterns for any time of year including seasonal and holiday-related. You can easily download and print out each book for on-hand reference while crocheting. On this page, find our most recently published eBooks. 6 Tunisian Crochet Blanket Patterns eBook- Learn to crochet the trendy Tunisian stitch with a how-to video, then make your own Tunisian crochet blanket from this hand-picked pattern collection. 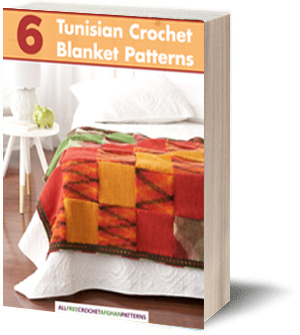 Learn more and download the 6 Tunisian Crochet Blanket Patterns eBook today. 12 Crochet Baby Blanket Patterns eBook- What’s the best way to celebrate the arrival of a new bundle of joy? Make crochet baby blankets, of course! There are so many options when it comes to simple crochet baby blanket patterns and you might find yourself a bit overwhelmed and in need of guidance. 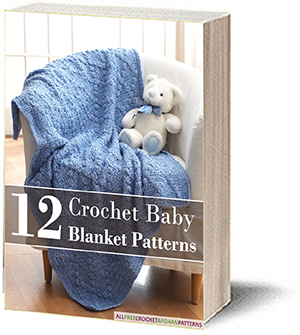 Learn more and download the 12 Crochet Baby Blanket Patterns eBook today. How to Crochet Blanket Patterns: 10 Round Afghans - Learn how to crochet round blanket patterns for your own DIY home decor with the How to Crochet Blanket Patterns: 10 Round Afghans eBook. From simple constructions to complex designs, there's a round afghan pattern for everyone! 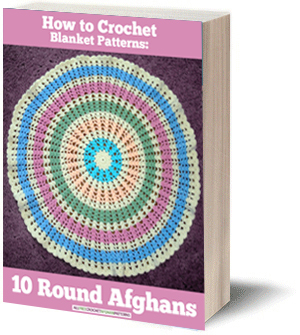 Learn more and download your copy of How to Crochet Blanket Patterns: 10 Round Afghans today. How to Crochet: 16 Quick and Easy Granny Square Patterns - Create unique crochet granny square patterns with the How to Crochet: 16 Quick and Easy Granny Square Patterns eBook. With a variety of colors, stitches, and pattern designs, there's a granny square pattern for every crocheter! Learn more and download your copy of How to Crochet: 16 Quick and Easy Granny Square Patterns today. 9 Pastel Colored Patterns for Crochet Baby Blankets - With the 9 Pastel Colored Patterns for Crochet Baby Blankets free eBook, you'll find a variety of crochet stitches and patterns in pastel colors. From ripple crochet patterns to granny square crochet baby blankets, these patterns a sweet, soft, and perfectly pastel. Learn more and download your copy of 9 Pastel Colored Patterns for Crochet Baby Blankets today. Color Scheme Crochet: How To Crochet 17 Colorful Crochet Afghans - Colorful designs and patterns fill this free crochet eBook to create a rainbow of free crochet afghans for all ages. From granny square patterns to crochet baby blankets, to full crochet afghan patterns, colorful crochet has never been more exciting. Learn more and download your copy of Color Scheme Crochet: How To Crochet: 17 Colorful Crochet Afghans eBook today.